“Competence for Tomorrow’s Mobility” is Brose’s theme for the International Motor Show in Frankfurt. The supplier is showcasing developments and ideas that will make driving safer, more comfortable and more efficient in the future. With its electric oil pump, the mechatronics specialist is taking a step towards system expertise in drive train actuators. A side door drive enables more comfortable vehicle access and can also be controlled via a smartphone. With its fully electrified seat platform, the company is underscoring its vision of flexibly adaptable interiors. “Brose is expressing its own goals with its theme for the motor show, “Competence for Tomorrow’s Mobility”. We want to play a major role in shaping the future of the automobile. As a technological leader in mechatronics – the interaction of mechanics, electrics and electronics – we have set high standards for ourselves, always thinking one step ahead and outside the box, and never settle for past achievements. Once you stop trying to be better, you stop being good,” emphasized Jürgen Otto, CEO of the Brose Group, at the company’s press conference during the motor show. Currently, Brose ranks 37th among global automotive suppliers and is the fifth-largest family-owned company in this sector. In 2015, the company’s executive board is striving for growth of 14 percent. In the first six months of the year, the regions of Asia (+31%) and North America (+32%) have posted exceptionally high increases in turnover. Developments in Europe, Brose’s largest sales market, have also been positive (+8%). As a result of this upward trend in business, the number of employees has increased once again. At the end of June 2015, there were about 24,000 employees worldwide working for the family-owned company, around 1,200 more than the year before. “We are constantly searching worldwide for the best people. We demand a high level of performance, but we are continuously developing regional talents and providing them with international advancement possibilities. We know that the motivation and dedication of our employees are decisive factors for market success. Brose is and will continue to be an attractive employer,” explained Otto. The company offers its employees a great deal of scope in their work, results-based remuneration and the opportunity to work at any location in the world in any corporate area. Additionally, there are numerous ways the company helps staff to keep their work, family and free time in balance. These include the Brose Kids Clubs, in-house fitness studios and variable working-time models. Brose consistently invests in expanding its expertise and setting up new locations. In 2014, four new plants went operational in East London (South Africa), Bremen (Germany), New Boston (USA) and Melfi (Italy). The company established a modern testing center for electromagnetic compatibility in Würzburg. The automotive supplier also increased its development and production capacities in 2015, and is planning investments of around 350 million euros. 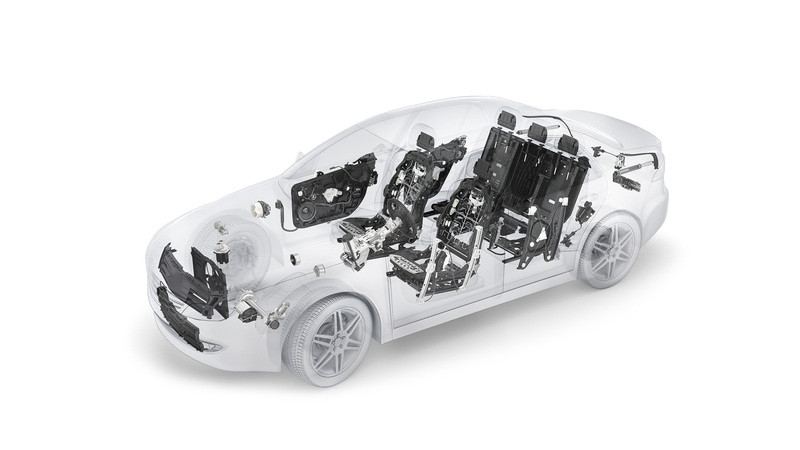 In addition to stepping up the company’s strong presence in Asia and North America, it will be investing considerably in expanding the German locations of Coburg (seat systems business division), Hallstadt near Bamberg (door systems business division) and Würzburg (drives business division). These locations are at the helm of global development activities. The greatest single investment is being made in setting up the new administration building in Bamberg, which will be ready for occupancy in 2016. About eight percent of Brose’s turnover is invested annually in research and development. The company has about 3,000 engineers and technicians at 19 locations in ten countries, which means more than 10 percent of all employees work in this field. Brose is showcasing ideas at the motor show that make driving safer, more comfortable and more efficient. With its drive for side doors, the supplier is presenting a new solution for comfortable vehicle access. Brose’s innovation moves hinged doors electrically and offers optional control via mobile end devices. A capacitive anti-trap protection feature ensures the necessary level of safety when the door is being shut. An integrated variable door check makes it easier to close the door manually. Additionally, the mechatronics specialist is demonstrating its expertise in lightweight design, for example, through further development of its door system made using organo sheets (long-fiber-reinforced thermoplastics). The material saves up to 2 kilograms in the vehicle compared to conventional plastics, but it can absorb four times as much energy. The reduction in weight is even 5 kilograms when compared to conventional steel doors. Brose is already supplying door systems made from this material. Using an innovative platform, the supplier is debuting the complete electrification of all seat rows. Based on this system approach, the company makes it possible for passengers to have a highly functional and flexible car interior: all adjustment levels can be fully remote controlled – for example via a smartphone app. The driver can configure the complete interior at the touch of a button, adapting it to everyday situations – whether many seats are required, or more space to transport luggage. Depending on personal requirements, the settings can be made and saved enabling maximum individualizations. An innovative rail concept for the seat length adjustment ensures that vehicle interiors conjure up a sophisticated and ordered ambience. Additionally, there is considerably more legroom for rear passengers. The electric oil pump represents another step in the company’s development to becoming a system supplier in the area of drive train actuators. The product comprises an electronically commutated motor, the control electronics and an integrated pump. The coordinated components ensure improvements in efficiency, acoustics and weight. The (auxiliary) electric oil pump enables the start-stop function as well as coasting, since it maintains pressure in the transmission when the engine turns off. It is possible to reduce emissions by up to 10 grams of CO2 per kilometer without placing constraints on driving dynamics. Restarting for example is faster. The mechatronics specialist has already been awarded contracts and series production will start in 2018.